It has been a very strong start to the day for European stock markets with UK traders pushing the FTSE 100 higher by around 0.85% after yesterday’s bank holiday. 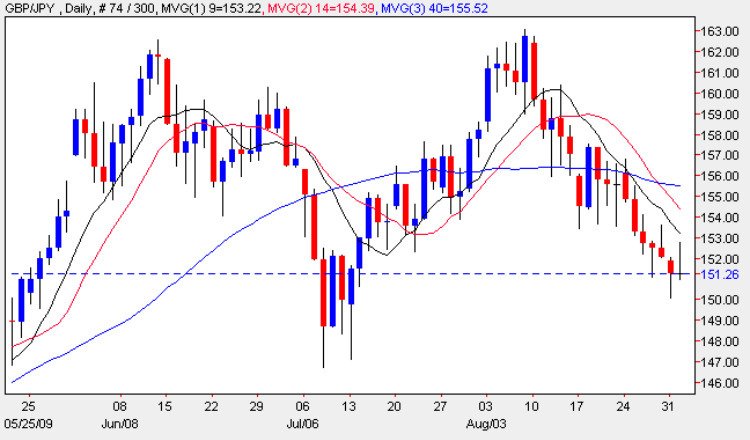 This follows a weak from the US markets which continued to respond to falls in the Shanghai Composite. However, some strong Chinese manufacturing numbers have given traders a shot in the arm. This morning we also have UK manufacturing PMI which is unlikely to have as dramatic an impact as the Chinese numbers, but is still an important announcement. Following this we have US ISM manufacturing at 14.00 GMT and Pending Home Sales at the same time. Appetite for risk has returned with the pound enjoying its best day since the middle of August. The UK single currency is up 0.45% against the dollar and 0.8% against the yen. The euro is also enjoying a strong day against the Japanese single currency, but it is Sterling which seems to be setting the early pace. Yesterday, GBP/JPY came within just 7 pips of hitting 150.00, but this morning’s rally is pushing the pair higher by some margin. The downtrend that started in August is still worth noting though and the GBP/JPY could still yet hit the psychologically important 150.00 level. A One Touch Trade over three days could be the best way to play this.